If there is any rowing machine that simulates the real rowing machine then that would be the First Degree Fitness Newport AR Rower Water Rower Exercise Machine. This machine can offer the real rowing feeling undoubtedly. It is designed to fit and suit every fitness levels or skills because it provides the option for the resistance to be adjusted and that is what the ‘’AR’’ acronym in the name stands for which is ‘’Adjustable Resistance”. It has got positive reviews and feedbacks as well and this is to show that this rower is a well-received machine by its users. That being said, when you set out to look for a good rowing machine for home use one of the things to look out for are the reviews, right? Then, from the reviews, you will be able to determine if the machine in question is popular or not. If it is popular, then you will move on to the second phase which is to find out if the features it possesses are right and suitable for you plus among other things such as the price as well because we all have a budget level and therefore will be concerned about the price tag of the machine. After getting all these information then we evaluate and move to decision making whether to buy or not. So, purchasing a rowing machine or any other fitness equipment is not a walkover because we do not want to spend our hard earned money on something that does not worth it. Therefore, this review will help you to solve all of these questions about the First Degree Fitness Newport Challenge AR Water Rowing Machine and points you in the right direction. The frame of this rower is made of steel while the seat rail is made of anodized aluminum. It is a very sturdy and quality piece of equipment that is backed by a reasonable warranty. It could rightly pass for the commercial grade even though it is officially categorized for home use by First Degree Fitness. It is a well designed and well-built machine that conveys the right feelings of a rowing machine. The stability is indisputable as the rounded caps at the base of the rower also improve it sturdiness and thus protect the floor from scratches or dents. The machine is very durable and supports up to 300 pounds maximum user weight capacity and accommodates users with a height that is up to 6 feet 7’’ inches since the rail/frame’s dimensions are 6 feet 5 inches long and 21 inches wide. So, it will suffice to say that anyone that is below 6 feet 8 inches should be accommodated conveniently without any sort of leg restrictions. Moreover, other parts that are made of steel are the base of footrests, the bases of the machine and the support of the water tank. These steel parts of the machine are actually responsible for adding weight to the overall weight of the machine and thus improving the sturdiness and stability of the unit during intense workouts. The machine also has transport wheels at the front base to provide easy and hassle-free relocation for storage. In case you are wondering if the machine is foldable, no, it is not but that should not be a problem when putting away for storage and saving space because it is usually stored upright with the water tank below. So, it will require 22 inches by 21 inches at the base and 78 inches tall storage space. It is designed to retain water without leakage during the upright storage of the unit. The seat and the handle are the major elements that are responsible for comfort when it comes to working out with a rowing machine. If the seat is well padded and contoured and the handle is ergonomically designed then chances are the user will experience comfortable workouts. Being said, the seat is designed to convey comfort of course because it is well padded and contoured to fit the butts. However, some users have complained of discomfort after sitting on it for an excessive amount of time. The seat glides across the rail in a smooth fashion and overall the seat is comfortable. The seat track is designed to operate smoothly as it is covered or rather concealed in order to prevent dirt from entering which ultimately makes it be cleaner, smoother and provides safe operation. The handle is ergonomically designed to prevent any sort of stress on the hands and arms because it is slightly curved to suit and provide comfort to any user. It is further covered with a rubber foam material to provide that comfortable feeling to the hands which also prevents blisters and enables the user to have a solid grip on the handle during workouts. Also, the handle is connected to a highly durable 1’’ nylon strap which is also connected to the pulling and returns mechanism. Obviously, comfort was one key element in mind when the First Degree Fitness Newport Challenge AR Rowing Machine was being manufactured. Its fluid technology provides smooth rowing stroke that is being admired and loved by the users. The First Degree Fitness Newport Challenge AR Water Rowing Machine has a water resistance system just as the name obviously suggests. A user experiences resistance each time the handle is pulled because there are paddles inside the water tank that is filled with water. The paddles spin inside the water tank thereby creating the intended resistance required. One of the characters that are always associated with a water or fan resistance system is the fact that the resistance intensity or difficulty increases whenever the user pulls faster and harder and it gets easier when the user works out slowly. So the air resistance system is similar to the water resistance system in the aspect of the faster you row the harder the resistance gets and the slower you row the easier the resistance gets as well. This type of resistance is said to be user-friendly because no matter your fitness level you will be able to use it since the resistance applies according to your pulling ability. Now, the water tank of this rower machine is made of solid polycarbonate material and it is capable of containing about 17 liters of water maximally. The tank is recommended to be filled with water up to 17 liters or at least 9 liters in order for it to function well. However, the maximum capacity of 17 liters is highly recommended so that the user can always enjoy it full benefit of its proficiency. Also, you may have noticed that this rower machine has this acronym ‘’AR’’ which stands for adjustable resistance. Yet, we have said earlier that the resistance intensity depends on how fast or slow you pull the handle, however, it does have adjustable resistance. The resistance could be adjusted by using the resistance setting which could be minimum or maximum. Technically, here is how it works; the tank has two chambers, namely the storage chamber and the active chamber. When a user sets the resistance at a minimum that means it will take few strokes to fill the storage tank leaving only a small amount of water in the active tank which ultimately will be less demanding when working out or pulling the handle. Whereas, if set at maximum, then the whole water will be inside the active part of the chamber thereby providing the user with a challenging workout. It is also important to let you know that the rower machine comes with water treatment conditioners box and a small pump for filling the tank with water. These enable you to fill the tank with water and also be able to treat it to prevent algae growth inside the water tank. So, you can truly adjust the resistance to suit your fitness level and skill. The water resistance system closely mimics the real rowing on water partly because of the variable resistance. It is said to have bearable noise that could allow you to listen to music without having to blast the speakers. Although, it also depends on how faster and harder the user is working out and the setting of the resistance. Overall, the noise is not a problem but instead, it gives you the feeling of rowing out on a real rowing boat on the water. Yet another unique feature of the First Degree Fitness Newport AR Rower Water Rower Exercise Machine is the patented dual-chamber tank with fluid technology. A user can experience different or varied resistance during a workout and also have the opportunity to adjust the resistance as well. 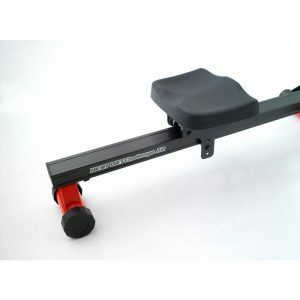 The resistance adjustable feature is one that is not commonly found in rowing machines except the likes of Concept2 D Model and Concept2 E Model which are kind of unique as well because these rowers do not have water resistance system. The fact that this machine’s resistance is adjustable also means that different users of different skills or fitness levels can use it. Both beginners and advanced users will find it very appealing. Due to the design of the resistance system with fluid technology, it offers smooth workout experience without any sort of obstruction that could cause annoyance or even injury or soreness in the joints. The First Degree Fitness Newport Challenge AR Rower is equipped with a performance monitor that is capable of showing workout data such as the time,500M time, tank resistance level, heart rate, stroke per minute, calories per hour, and watts which allows the user to keep track of workout progress. These workout data are the necessary information needed by a user to be on top of achieving fitness goals and also be able to remain focused. It has a high readability monitor that won’t place unnecessary strain on the eyes although it has to be used in a well-lit room or area because it is not a back-lit type of monitor. A user has the opportunity to set a preferred distance by pushing the ‘’ADD 100M EACH TOUCH BUTTON’’. The monitor can be synchronized with the water tank in order to provide the accurate tracking information. Let’s say the setting on the monitor is level 1 and the setting on the water tank resistance is level 4 this means there will be an inaccurate supply of data by the console. The settings on both the water tank resistance and the monitor have to be the same so that the correct information will be created and be exhibited. A user should be able to monitor the calories burned as well and there is a USB feature available on the console that allows the user to connect a computer to the monitor. This means that a user can use NetAthlon 2 XF for Fluid Rowers program that makes competing virtually with other people on the internet possible. The monitor comes on when rowing activity is resumed on the rower and it gets back to a default whenever activity stops for 5 seconds. Basically, the stroke per minute, watt and 500M will be zero, whereas distance and time will be saved and the calorie/hour will become total calories. The console is powered by 2 AA batteries which are included upon purchase of the rowing machine. However, it is important to let you know that you will have to purchase the heart rate separately if you wish to monitor your heart rate during a workout. This is optional and does not cost much to acquire one. An approval rating is one aspect that cannot be ignored when looking up a fitness equipment to purchase because that basically tells you almost everything you need to know about the machine in a nutshell. And of course, we consider the feedback and the reviews by real users of any given machine we intend to review because you get to know if the claims of manufacturers can be collaborated with what the end users are saying. 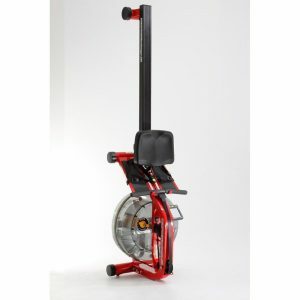 So, in the case of the First Degree Fitness Newport AR Rower Water Rower Exercise Machine, the machine has got some positive feedbacks and approval rating that says it is recommendable. Ordinarily, this is a good sign and an indication that you should consider purchasing the machine but not without some additional examination. As at the time this review was written the approval rating of this unit is 4.6 out of 5 on Amazon after 52 customer reviews which indicate that the users reviewed the machine favorably. The resistance may not be too challenging for advanced or strong users. It could have been great if the machine supports up to 500 pounds instead of 300 pounds that it currently supports because other rowers of almost the same price range such as the Concept2 Model D supports up to 500 pounds maximum user weight capacity. The shipping of the First Degree Fitness Newport AR Rower Water Rower Exercise Machine depends on where you are purchasing the machine from. Retailers have different policies regards to shipping, however, Amazon usually provides free shipping. To assemble this unit is pretty easy as the major components are preassembled. Moreover, it is relatively easy and simple to assemble since it is accompanied by an instruction manual that could walk you through the process of assembly without much stress. You basically need to attach the rear base, and then attach the seat rail on the frame and then the seat. Fix the batteries into the console and then fill in the water tank with water as it comes without water in it. The tools required for assembly are included. The maintenance of this machine is very minimal because the rail that should have required maintenance is concealed by design and so that leaves you with the treatment of the water. This is not also a big deal because you take delivery of the unit with the water treatment pack included so that you can treat the water in the tank from time to time to avoid seaweed growing in it. There is nothing that is ever perfect and that includes the First Degree Fitness Newport AR Rower Water Rower Exercise Machine. But the good news is that the upside of the machine outweighs the downside greatly. 96% of the 52 Amazon customers that reviewed the machine gave it thumbs up and they will surely recommend it. 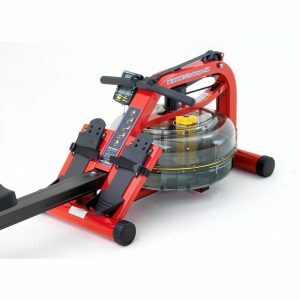 The reason is very obvious because it is undeniably a very solid and sturdy machine that has unique features such as the fluid technology and adjustable resistance. These features are not commonly found in rowing machines. It also offers the feel of rowing a real rower with minimal noise that could allow you to listen to music or watch your favorite TV show; however, this depends on how hard you are working out though. Even though some users have complained about the resistance being too easy, the majority of the users do not have any qualms about the resistance. Also, the complaints came from a very few people that might also not know how the resistance works because the faster you row the harder and challenging the workout becomes and the slower you row the easier the workout becomes. It is as simple as that. Overall, this is a very recommendable machine that HTBTB would recommend even though we think that the machine ought to have come with the heart rate instead of having to purchase it separately and optionally. If you don’t have anything against rowing machines with air resistance system we strongly recommend you look up the Concept2 Model E Rowing Machine. Do not hesitate to holler at us if you have any questions and we shall be very glad to respond accordingly.